This month Gala announces a new parkrunner of the month competition, Intersport count down to visiting Ireland, Conor Flannery tells us why he loves volunteering on the lead bike at parkrun, and Ronan Toomey explains how parkrun Ireland is involved in the government’s new National Physical Activity Plan. There are many risks to the health and wellbeing of people living in Ireland. Some of them are obvious: issues such as being overweight or obese, physical inactivity, mental health, smoking, alcohol and drugs. Healthy Ireland is the Government-led initiative which aims to create an Irish society where everyone can enjoy physical and mental health, and where wellbeing is valued and supported at every level. It’s important to say that the Healthy Ireland emphasis is on individual choice and works to empower and support individuals, families and communities to take the lead on improving their own health and wellbeing and to make the healthier choice the easier choice. Taking part in community-based physical activity initiatives such as parkrun provides huge physical and mental health benefits for everybody involved, participants and volunteers alike. We know that the evidence tells us that community initiatives help people to be active by providing supportive, encouraging environments. There are also tremendous social benefits to parkrun, encouraging people to engage with their neighbours and wider community. parkrun provides opportunities for social interaction that help to build community spirit, community networks, reduce isolation and exclusion and build social cohesion. Volunteering is also known to be very beneficial for your health and great credit is due to everybody who gives freely of their time to make sure that parkrun happens. Recently, the Government launched Get Ireland Active – the National Physical Activity Plan for Ireland – because being physically active is probably one of the single most important things that we can do for maintaining or improving our physical and mental health and wellbeing. We know that no one Government Department or agency has over-arching responsibility for promoting greater participation in physical activity. Many policies and programmes across many areas such as health, education, sport, recreational physical activity, transport and environment all have important and interlinking roles to play. That is why we are working in partnership with many different organisations such as parkrun to create more opportunities for people to be active. Over the past few weeks, the emphasis on enjoyment and fun rather than competition at parkrun is even more evident both with the first new junior event In Rush and with all the people joining in from Operation Transformation. Our National Physical Activity Plan is about creating an environment so that we can all take simple steps to increase our physical activity levels, particularly those who do not take part in any form of physical activity. parkrun is playing a very important role in this aim to get Ireland active. At locations all over the country, a huge welcome is always shown to regulars and newcomers alike. The atmosphere of fun and enjoyment has been very visible recently on national TV and at the locations we have visited. Everybody in the parkrun community should be very proud of everything that makes each event so special. It is also worth acknowledging and thanking the managers of the facilities where parkrun is happening all around the country. It is fantastic that we have so many wonderful parks and open spaces in Ireland that can be used to promote physical activity. Being physically active as part of a healthy lifestyle is one of the most important things that anybody can do for their health and wellbeing and being active has benefits beyond individual health, into family, wider community and society generally. All physical activity counts and doing more is better. By including it in every part of our daily lives, whether at home, at school, at work or at play, physical activity can help us to live longer and have a better quality of life. Best of all, being active can be and should be fun! And that is why the HSE through its physical activity promotion initiative GetIrelandActive and Healthy Ireland are delighted to support parkrun. Find out more about us on Twitter @healthyireland and @getirelandactiv and on Facebook at hihealthyireland and getirelandactive. Next month will see the launch of ‘Gala parkrunner of the Month’. Debuting on the Gala Facebook page, a Gala ‘parkrunner of the month’ app will allow parkrunners to vote for who they think should receive the monthly title and receive a €50 Gala shopping voucher. The shortlist of nominees will be provided by parkrun Event Directors and whittled down to a final eight nominees, who will appear on the app, allowing parkrunners and the wider parkrun community to cast their votes. Nominations from parkrun Event Directors will commence on Monday 15th February, with a view to having the first parkrunner of the month voting commencing in early March. Watch this space and ‘Like’ the Gala Facebook page for news on the first ‘Gala parkrunner of the Month’. January saw the first event where parkrun’s new partnership with Intersport across the UK and Ireland was visible to the parkrun community, and we would like to express a big thank you to all the parkrunners who celebrated with us at Wimbledon Common parkrun. We proudly put a stake in the ground at this first partnership event in West London, which coincided with the opening of our new Intersport store in Wimbledon. We will be coming to Ireland soon for a celebration of the partnership and the community collaboration, and we are looking forward to seeing you all then. Further details will be unveiled in the next newsletter. 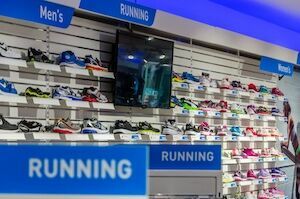 In the meantime we would love to see you in our stores and to offer expert advice about all things running. Intersport is proud to be connected to parkrun and to be part of the growth of new parkruns across Ireland, bringing sport to the people together. Please visit our website for further information about Intersport and store locations. I just wanted to let you know that you've had a parkrun success. I have just paid my athletics club membership and agreed to run in the novice road race for them. Before parkrun I had never run, not even in school, so thank you for opening up this whole new world to me. Has parkrun made a difference to your running, or do you have an interesting or amusing story to share with the parkrun community? If so, drop us an e-mail and we willinclude it in a future newsletter. Favourite volunteer role: I have volunteered 27 times, mainly as lead bike. I'm well known for it and love the bit of exercise while pushing the front runners to their limits as well as encouraging everyone along the route. I still haven't had a mid-run puncture so I must be doing alright. 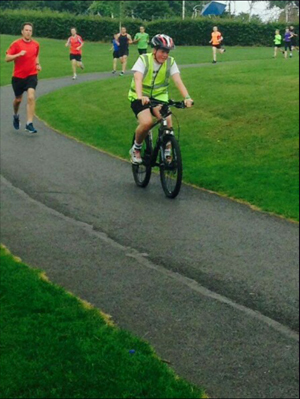 What do you do at parkruns: While I enjoy running at Cabinteely parkrun from time to time, I also volunteer on a regular basis as one of my Silver Gaisce Award activities. Gaisce – The President's Award – is a self-development programme for young people and requires participation in several activities. Every Saturday morning I get up and cycle over to Cabinteely Park to help set up the course. I then do my part by being lead bike and after what is usually a well enjoyed parkrun with smiles all around, I help pack away the gear, collect the signs and make sure all is packed away and ready for next week. 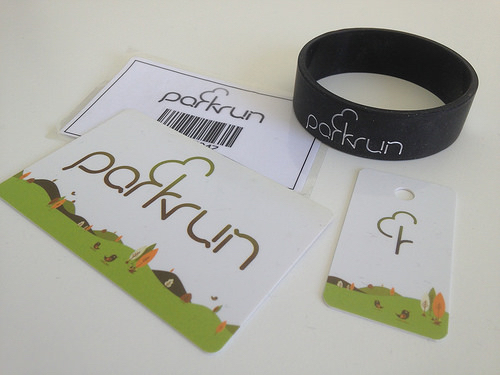 How has parkrun changed your running: If I said I hadn't run before parkrun, it'd be a lie but parkrun made me enjoy running and makes me want to get out for a run. If it's before school or just to get away from homework momentarily, running is a great way to stretch the legs and get some fresh air. Running has kept my mind active and has made me become fitter and healthier in the past year. parkrun has made me realise how amazing and fun running is: it's cheap, can be done anywhere and you're sure to feel amazing after it. "I really regret that run" said nobody ever! What do you like about parkrun: It's getting up early and seeing the smiling faces in your local park that makes it enjoyable. Knowing I'm helping out and making it happen gives me that extra sense of enjoyment. I get home, having done a whole morning of parkrun, and I'm still up earlier than I would be if I had a lazy Saturday, still with a whole day ahead of me. The fact that people from all around the community as well as all around the world can gather on a Saturday morning in the rain or sun and together create such an enjoyable 5k for families to avid runners to participate in, is incredible. The spirit of it all is amazing and as any parkrunner knows, running with a bunch of people is a lot more enjoyable than running solo. Most memorable or funniest parkrun moment: It was the morning of the clash between Ireland and Scotland in the European Qualifiers in Dublin. I would have been surprised to see some eager Scottish runners up early for the run before the game but when a group arrived in kilts and in good humour, I knew it was going to be a great day and a great match later on. Unfortunately, we didn't get the full three points!